THE MARTIAN ATMOSPHERE is persistently hazy. The haziness is due to the scattering of light by suspended dust and condensate particles. This haze causes the Martian sky to be gray to yellow instead of blue as on Earth; the blueness of Earth's sky is due to the scattering of light by air molecules. Superimposed on the Martian haze are various types of local condensate clouds and fogs. At times, dust storms raise great yellowish clouds that stand out against the haze and ultimately contribute to it. Because the axis of Mars is tilted with respect to its orbit plane, the Martian atmosphere undergoes seasonal changes analogous to those on Earth. Viking spacecraft arrived just before northern summer solstice. Approach images show a relatively dense haze covering the northern hemisphere and a much clearer atmosphere in the south. With the beginning of southern spring, an even denser haze blanket formed over the southern hemisphere, largely obscuring the surface even from vertical view. Later this southern haze thinned but, as southern summer approached, dust storms again obscured far, e areas. Northern latitudes were obscured by condensate clouds and hazes during fall and winter in that hemisphere. North of about 60° latitude, this "polar hood" was diffuse and featureless and, because of the very low atmospheric temperatures s in these regions, is believed to be at least partly carbon dioxide ice particles. The zone between 40° and 60° N was swept by fronts that moved south out of the polar regions; cloudiness was associated with these weather systems. 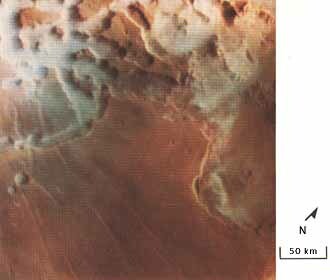 Images of the Martian limb regularly show a high, layered haze structure extending to more than 35 km above the surface, with individual layers typically extending over large areas. The vertical distribution of light-scattering particles is not directly proportional to the brightness profile in the limb image. This condition is because lower layers are seen along paths of varying length through upper layers. The true distribution of scatterers was calculated, and results revealed the existence of clear layers between the cloudy ones. The diffuse haze blanket itself is not without structure. In some regions its features include broad longitudinal streaks, cellular lumpiness, and wave trains. Cells, which range in size from about 1 to 10 km, indicate convection within the haze blanket. Wave trains up to several hundred kilometers long are visible in a large percentage of high-altitude frames near the morning terminator. These waves are visible because of the alternate condensation and evaporation of ice crystals in the troughs and crests of a pressure wave traveling through an atmosphere of high static stability. One prominent type of condensate cloud on Mars forms around the giant volcanic mountains of Tharsis and Olympus. These clouds, evidently formed  by orographic uplift, form in late morning and obscure the flanks of the volcanoes up to an elevation of about 20 km, leaving the summits unobscured. In Earth-based observations, these clouds have bet n known for decades as the "W clouds" because of their repeating configuration. 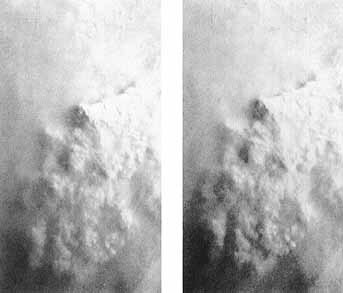 Other types of condensate clouds occur over less than 1 percent of the Martian surface at any particular time. These include convective-like-formations, cirrus-like wisps, and low-lying canyon clouds. Observers using telescopes have known for many years that global-scale dust storms arc common when Mars is closest to the Sun in its relatively elliptical orbit. 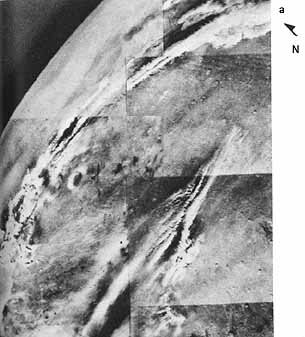 Such a storm enveloped the planet when Mariner 9 arrived at Mars. 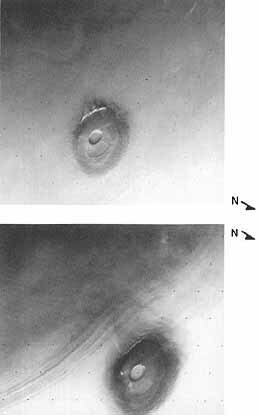 Two smaller global dust storms were observed by Viking orbiters during the e extended mission. The first occurred early in the southern spring, and the other shortly after southern summer solstice. Both storms probably started in the Thaumasia- Solis Planum region, and rapidly engulfed most of the planet. 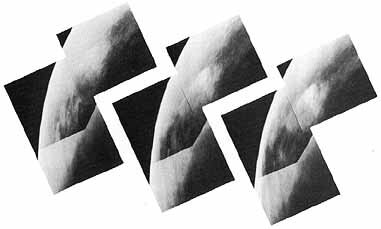 They greatly affected meteorology at the landing sites, and each prevented the acquisition of clear images of the Martian surface for 2-3 months. 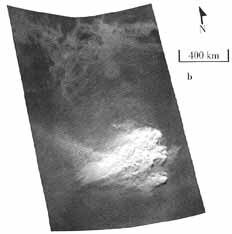 Several dozen localized dust storms were also observed by the Viking spacecraft. 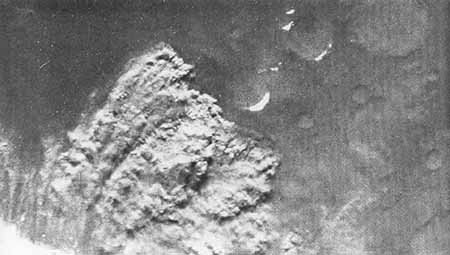 Most of these occurred near the retreating south polar cap or in the region to the south of the canyons on the southeastern slopes of Tharsis. Low Pressure Cell near North Pole. This Martian storm was observed by Viking Orbiter at about 65° N latitude. The local season corresponds to late July on Earth. 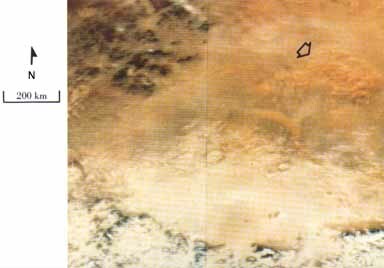 The storm is located near Mars' polar front, a strong thermal boundary that separates cold air over the pole from the more temperate air to the south. Shadows indicate that the clouds are relatively low in the atmosphere. Because temperatures in this region are well above the condensation temperature of carbon dioxide, water ice is the probable constituent of the clouds. Water vapor concentrations are high (by Martian standards) during this season in the north polar region. This system strongly resembles satellite pictures of extratropical cyclones near the polar front on Earth. The counterclockwise circulation is consistent with the winds normal low pressure situation.